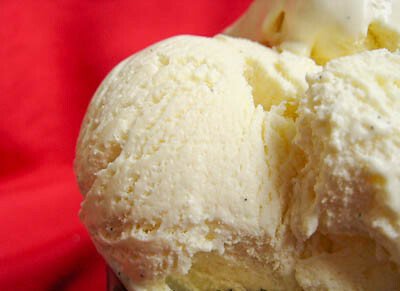 This week's Tuesdays with Dorie (TWD) recipe was chosen by Lynne of Cafe LynnyLu: Vanilla Ice Cream. What a perfect pick for summer! 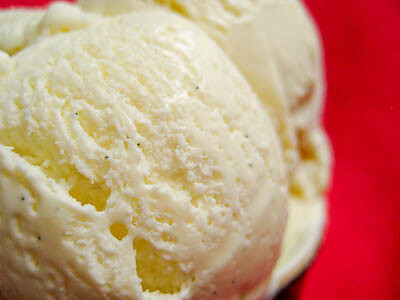 It's your basic custard ice cream recipe, flavored with either a vanilla bean or some vanilla extract. For those who have never had homemade vanilla ice cream before, I promise you won't be disappointed. I used to not make much ice cream because it was always such a pain to buy whole milk. The small containers are just as expensive as a whole gallon of milk, and if I bought anything bigger, it would go bad before I could use it all. Since discovering how to make whole milk from regular milk and half & half/heavy cream, I've been making a lot more ice cream :) It's so convenient because we always have milk and half & half on hand. The smell of this custard before it was frozen was so fragrant, I could tell it was going to be good ice cream. We recently made Brown Sugar Vanilla Ice Cream for Sweet Melissa Sundays and I was anxious to see how Dorie's vanilla ice cream would compare to Melissa's. Dorie's ice cream was rich and creamy, perfect by itself or drenched in some hot fudge or caramel sauce. 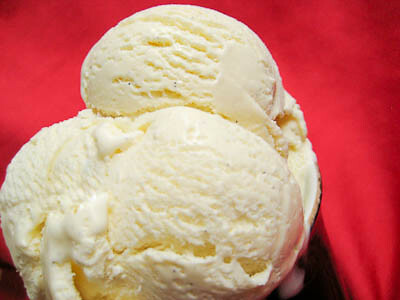 Using vanilla beans in place of vanilla extract definitely gave the ice cream a fuller flavor. I have to say that in this case, though, the Brown Sugar Vanilla Ice Cream I made a few weeks ago was better. The brown sugar flavor was very subtle, but still made it extra special. I encourage you to try both recipes for yourself and see! Thanks Lynne, for picking this recipe. If you would like the recipe, you can find it here. Check out the TWD Blogroll, and see how everyone else enjoyed this cool, summer treat! I've got to give that brown sugar ice cream a go...it sounds terrific. As compared to other vanilla ice creams, I thought Dorie's recipe was mighty fine. I liked the SMS ice cream, too. I do like this one as well, though. Nice job! I loved this ice cream too. Yummy! This was my first vanilla ice cream. I want to try the SMS one too. Great job! I like your tip about making whole milk from half and half! The ice cream looks fabulous! Looks like perfect, creamy ice cream. I made the SMS ice cream twice already this month, so good! Very useful information on milk/cream/half&half, I always have odd amounts of dairy products from various baking projects. I haven't tried the brown sugar ice cream, but now I have to - I really liked this recipe too, so if that one's better - wow! looks great!! like you, i rarely have whole milk at home...am always making ice cream with 1% plus a touch more cream. and that sweet melissa brown sugar vanilla IC you mentioned is one of my faves as well...i've made it several times. Looks really delicious Jaime. I have made any ice cream this summer. Better start to do that soon. That is some beautiful ice cream! I haven't had a chance to make this yet, but I'm very anxious to. I loved the SMS ice cream, too, and I'm interested to see how this one measures up! Your ice cream looks perfect. I love vanilla. (As always) Your photos look perfect. I'll have to try that Sweet Melissa Brown Butter! Your ice cream looks really creamy and delicious! I may have to try making that brown sugar version, sounds good! Jaime thanks for the whole milk tip/link! I never buy whole milk and just use my 2%. I'm sure I've been missing out but now I won't have to. I loved the SMS vanilla so much that I tried subbing brown sugar in Dorie's recipe. It didn't turn out as well so I'm going to have to try it again with regular sugar. Your ice cream looks fantastic! Love the vanilla specks! Mmmm... you're making me wish I had some ice cream right now! It looks delicious. I've been drooling over this ice cream all week! You did a fantastic job. 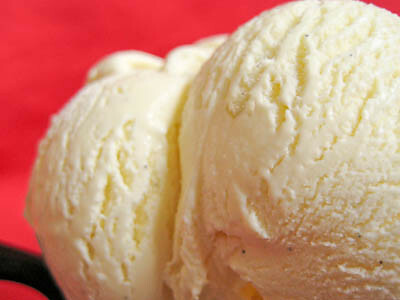 Your Vanilla Ice Cream looks like creamy perfection! I love your photos too - the background color really pops! Great photos - your ice cream looks great. The brown sugar ice cream recipe definitely sounds like one to try! I'll have to try the brown sugar ice cream. Your vanilla looks great and thanks for the whole milk tip. I have had so many containers go bad on me. Thanks for making Dorie's recipe with me.